The first pan European Marine Litter Database (MLDB) has been developed by EMODnet Chemistry. 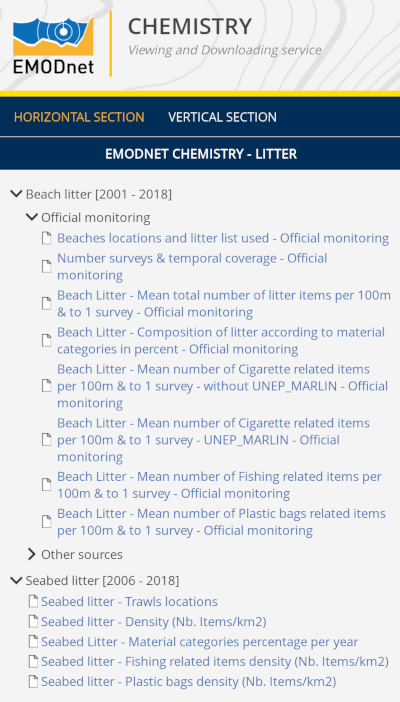 The database contains data of beach and sea floor litter from a variety of sources, including existing International and Regional Sea Conventions, and data submitted by EU Member States, EMODnet partners and external research or monitoring projects. A majority of datasets were provided by existing monitoring projects which have published their data in project specific databases (i.e., OSPAR, ICES DATRAS). These databases may hold more and differently formatted information than is provided here, so direct comparison with these sources is not always possible. The MLDB is a great milestone in the harmonisation of the available information at European level. Data from very different sources have been gathered into the MLDB in common beach and sea floor formats developed in the framework of the project. The new formats have been developed based on existing monitoring protocols and data reporting formats and allowing to process heterogeneous datasets while keeping the main information and metadata. 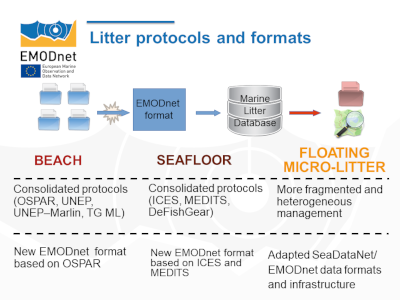 In addition to the MLDB, EMODnet Chemistry holds data of floating micro-litter from EMODnet partners and external research projects. Floating micro-litter data are gathered in the system using a specific version of ODV format, where relevant characteristics are codified using common vocabularies. The MLDB and floating micro-litter data are accessible via the Data Discovery and Access Service. The Service provides relevant metadata, including identifier, date and location of the survey, data originator and data holding center for all datasets. The data are available for downloading in the EMODnet Chemistry formats, depending on the specific sharing policy (public, restricted, moratorium...) applied by the originator. Marine Litter Visualization Products are available through the Viewing and Downloading Service. The first release of the products include maps showing beach and sea floor surveys locations and summarized metrics of the MLDB content. Beach litter maps include temporal coverage of surveys, beach litter distribution (mean abundance per year) and beach litter composition (litter material categories in percentages). Sea floor litter maps show information about the fishing gear used, litter distribution along trawls (density as items/km2) and litter composition (material categories in percentages). Maps illustrating the distribution of relevant litter types are available for both beach litter (cigarette related items, fishing related items and plastic bags) and sea floor (fishing related items and plastic bags). The products may be freely used for non-commercial and educational purposes. However, data in the maps have been homogenised and filtered in order to allow comparisons among countries. Thus, EMODnet Marine Litter Visualization Products might not be comparable with source data accessible through other platforms. EMODnet Chemistry is not responsible of the use of the data and products by third-parties. Users are requested to ensure proper acknowledgment of the EMODnet Chemistry project and the data originators. More information about the MLDB and the methods used for creating the visualization products can be found in the EU publication Marine litter database and in the project document about Visualization Products.